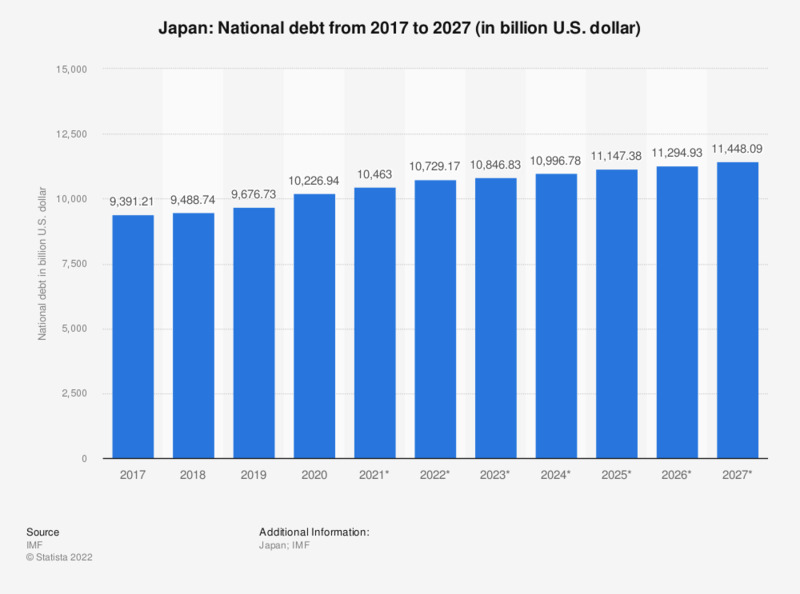 The statistic shows the national debt of Japan from 2012 to 2016, with projections up until 2022. The amount of Japan's national debt in 2016 amounted to about 11.2 trillion U.S. dollar. In a ranking of debt to GDP per country, Japan is thus currently ranked first. With one of the largest gross domestic products (GDP), Japan is among the largest economies in the world. However, ever since the global financial crisis, Japan's GDP - like many others - has been slightly unstable; Japan even reported a negative GDP growth in comparison to the previous year in 2011 and in 2014. Still, it is estimated that gross domestic product in Japan will continue to thrive over the next decade. One indicator is Japan's inflation rate: Despite the aforementioned economic slumps, Japan has managed to maintain one of the lowest inflation rates in the world, and it also reduced its unemployment rate. Between 2010 and 2013, the unemployment rate in Japan decreased by approximately one percent, and it is expected to drop even lower over the next years. Recently, Japan has been reporting a trade deficit, meaning the value of its imports exceeds the value of its exports. Most of these imports have come from China and the United States. The trade deficit is one of the causes for in an increase of the national debt. It is estimated that the national debt in relation to the GDP will increase further until 2020.